Vole O'Speed: Getting cyclists "out of the way of cars": is it wrong? This post is related to a marvellous post on As Easy As Riding A Bike, which discusses the traditions of cycle campaigning in the UK, and, in particular, the "No Surrender" (of the right to use the highway) attitude which originated in the 1930s and continues to be a major force in determining attitudes of British cycling organisations today towards cycling provision, good and bad. I urge you to read it, if you haven't already done so. It's long, and if you have even more stamina, you can read the comments as well. The second most popular post on the present blog, 1934: The moment it all went wrong for cycling on the UK from 2011, was on a similar theme. The Cyclists’ Touring Club stated that the provision of cycle paths at the side of any of the main roads would not be with the object of giving cyclists a good path on which to ride, but to remove them from the road in the interests of motorists. So we have the from this stage association of "the interest of motorists" with the convenience, safety and relaxation of traffic-free cycle paths, as if the former were an undesirability so huge that it necessarily trumps the latter. The sentiment is effectively: "A cycle path might be lovely for cyclists, but it might also help motorists to go faster, so we can't possibly have that". To feel valued, not "kept out of the way of the traffic"
So again there is this opposition being set up between benefiting cyclists and benefiting motorists. If cyclists are valued, then they will not be "out of the way". And when I have heard Roger Geffen, the author of this document, talking about the results of this survey, this has been a point he has always emphasised: "yes" to segregated cycle facilities, in the right places, if they are good enough, but "no" to just "getting cyclists out of the way" of motorists. The trouble is that the one effect of constructing segregated tracks on main roads, where segregated paths are most needed, must be to "get cyclists out of the way" of the motor traffic flow. But why is this seen as such a big deal? Why is it seen as wrong? It's partly a matter of language, of course, of phrasing, the way the situation is expressed. Deliberately negative language is being employed by the cycle advocates quoted here. One, more constructive, way of thinking about the segregation of modes is to say that we are "segregating cars away from people". And there is always a pro-safety argument to segregation, for any of the modes segregated, foot, bike or car. If you make each flow uniform in terms of speed and momentum, as nearly as you can, which can never be achieved when mixing modes, then you reduce the change of serious damage occurring as a resault of accidents. This is one of the principles of Dutch philosophy of sustainable safety. If motorists do not have the worry of how to negociate around bikes, vehicles with very different characteristis to their own, it takes one stress away from them and one source of unpredictability in their enviornment, a thing that they might well welcome, and a thing that might actually be beneficial even to their safety. But does that make it wrong? Are cycle advocates supposed to be so opposed to motor culture in all its forms that anything that is done that might make life easier or safer for motorists must be opposed whatever possible benefits it might also have for cyclists? And yes, if we get cyclists "out of the way" of cars, then, on some roads, in some circumstances, that might cause cars to go faster. It might result in smoother journeys, and these might be more fuel-efficient. Lesss pollution might be generated by a road traffic composition which allows drivers to cruise rather than have to break behind cyclists and then accellerate to overtake them. Is all this wrong? Now, in the early stages, the period of the 1930s in Britain discussed above, I think part of the driver for the "don't get cyclist out of the way of cars" attitude was the frequently poor quality of the cycle path alternative that was on offer: though whether there was or was not generally a more fundamental philosophical objection behind this, such that no quality of cycle path would have been good enough for the leaders of cycling, it was the "principle of the thing", is open to debate. And of course the quality of cycle facilities continues to be the big issue in the UK, as this blog has continually pointed out from the first. But we do see the same objection raised, weirdly, even when the quality of the provision for bikes is world-class, and the results massively successful in transport policy terms. Here's the example which actually prompted this post. Mark Wagenbuur posted on his blog Bicycledutch a piece about a new flyover for bikes that has been constructed at Enschede. It looks rather good. It allows them to cross a main road without interaction with the motor traffic at all, replacing what used to be a signalised crossing. It allows more capacity for bikes, because they don't stack up at the lights, and it takes away a delay (replacing it with a slightly longer journey as cyclists have to cycle a curved ramp to get up to the flyover). Of course, there are equivalent benefits to motorists. Because the crossing is eliminated, the capacity of the road is increased, motorists' journeys are speeded-up, and their journeys are likely to be more fuel efficient, because they do not have to stop here anymore. So basically here you have major infrastructure dedicated to cycling, constructed at great expense, to totally separate cycling form the motor flow. Something you get a lot in the Netherlands, the word's most cycle-friendly nation: there are other good examples on the same blog. So, to quote Anna Soubry, Health Minister, giving evidence to the all Party Parliamentary Cycling Group Enquiry yesterday, "What's not to like?" And in the three letters of that "Hmm" lie a distillation of a century of "attitude" in the relationship between cycling activists, motorists, and infrastructure in the UK. The example here is a slightly new type, as this is not the old business of objecting to the "pushing off" of cyclists on to paths, the paths were already there. Now the Dutch are going further, as they are increasingly doing all over their country, and separating by level to completely divorce the cycling experience from the motoring environment, rather than relying on the old methods (old for them, but still not much adopted in the UK) of signals to share space at different times on the level road crossings. The objection now seems to be that this is taking away some "function" of cycling in limiting or controlling traffic or "civilising the environment", and you see this very often in British and American writings on sustainable transport. Cyclists [in Münster] are treated as a proper flow of traffic, integrated into signalised systems. There are generally not multiple levels of transport infrastructure, as beloved by British traffic engineers. Space is shared at surface level, and cyclists and pedestrians are not inconveniently forced up and down over bridges or through underpasses. Motor traffic is made to give way as necessary to give the sustainable modes enough priority. A recent innovation in Assen: where there was previously a level intersection between the motor trunk road and the cycle road, there is now no contact between them. The road is elevated and isolated behind noise barriers. The Dutch model, make no mistake, has been the most fantastic success in achieving very high cycling levels, around 20% of all journeys, in a country where most people can afford cars. 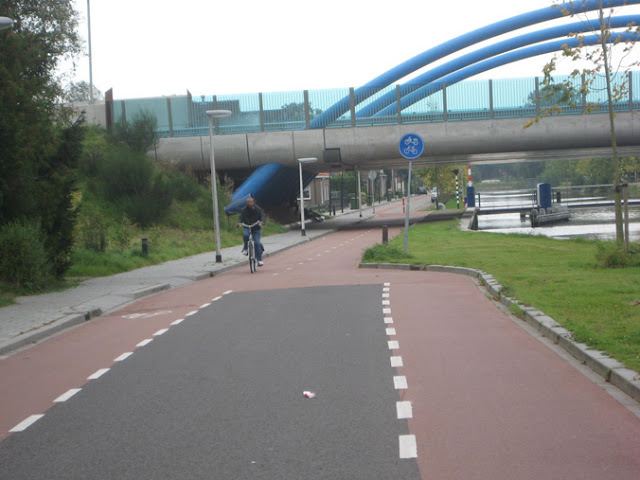 It's a success that is not totally dependent on the technology of bridges, underpasses, roundabouts, signals and tracks, but that is a very large part of it, as anyone who has experienced it, or read the blogs Bicycledutch and A View From The Cycle Path will know. But, at least in the UK, and probably elsewhere, we have a strand of opinion that wants to reject this technology for other reasons. We see it very strongly in the writings of Bob Davis, founder of the Road Danger Reduction Forum. Much of what Bob says on that site I actually heartily endorse, and many of his writings have been very influential on my thinking in the past. But Bob's interventions on the As Easy As Riding A Bike blogpost are classic of this "Not out of the way" strand of thinking. It's like there is another agenda going on behind this cycling thing. You may have thought that when you get on your bike, you are just using it as a cheap, efficient and fun way of getting from A to B with minimal invasion on the pleasure and convenience of anybody else. But no, in a fundamentalist "pro-integration of all forms of traffic" world-view, what you are doing is serving a higher function. You and your bicycle are helping to control the motor traffic. You are making it go slower and you are "civilising the street". No matter that you didn't ask for this job, it is YOUR JOB, as a sort of Holy Responsibility, to sort the whole world of transport and the urban environment out, and "civilise the street" by getting on your bike. You are just the instrument of this method of civilisation of the city. YOU are The Martyr. The thing is, most people just want to ride their bikes, and not have to interact with motor traffic, and they don't think it's their job, when on two wheels, to "get in the way" of cars and slow the traffic. Many British traffic planners seem to think it is, witness the rash of road narrowing schemes in London, where a stated objective is often deliberately to allow insufficient space for cars to overtake cyclists in the narrowed lanes, so cyclists regulate the speed of traffic. I am one with many other cycle bloggers who think this is a terrible policy that will do nothing for the attractiveness of cycling. Now, don't get this wrong, I do believe we should have slower, more civilised city streets. I do believe we should have more genuine "sharing" of space on streets between drivers, cyclists and pedestrians. But doing that, I think all the successful European models conclusively show, involves reducing motor traffic to a bare minimum on streets (as opposed to roads for movement, of which the road in Enschede with the cycle bridge and the road in Assen with the cycle underpass were examples), and enforcing very low speeds through both policing and design. So achieving that "sharing" and that "civilisation" is mostly about actually removing motor traffic, in practice, and what that means is the deployment of the technology of segregation in its various forms, providing routes round urban centres that are specialised to take the heavy through-traffic from one place to another, with suitable alternatives for pedestrians and bikes, and unravelling modes so that the streets you want to be civilised in town centres are actually dominated by human traffic. To get that dominance, you have to allow safe and pleasant mass cycling, cycling for all, regardless of determination or willingness to act as "human traffic calming" or "street civilising material". For that you need all the apparatus of segregation, of low speed limits, of preferential treatment and priority for cycle traffic. You need quite a lot of engineering. All the experience of cycling systems the world over shows this. The trouble is in part that people have different agendas, and campaigns for more or safer cycling can get wrapped up in all kinds of other political objectives. I take the view that the car is here, with us, to stay, for a long time yet. We can't abolish it, but we can get people to make smarter travel choices, and only use it when it really is the most sensible mode for the purpose, and walk, cycle and take trains at other times, for the vast majority of their journeys. We need to employ the best methods we can to do this, and we need to do the things that have been actually shown to work to get people on bikes in societies similar to our own. We can't solve all the problems of the world and of the environment in this one step, and we can't get rid of private motorised transport. We can engineer its environment so that it is less intrusive on our cities and countryside and less obstructive and less discouraging to the sustainable modes. It may well be, indeed it is the case, that sometimes, in the history of debate on these things, the most rabidly petrol-headed of commentators or law-makers has been in favour of the construction of cycle paths ands tracks principally in order that cyclists should be got out of the way of their motorised activities. But that is not an adequate reason to go on opposing proven solutions which demonstrably can create a better transport environment for all, more inclusivity of mobility, and innumerable health and social benefits. That is a simplistic politics of reaction – "My enemy thinks it is good, so I must oppose it" – not reason, that we need to move beyond. For ultimately the "not out of the way" mentality is a motor-centric one. We don't think it unreasonable to keep bikes and pedestrians "out of the way" of trains or aircraft. Why not? It's that this "not out of the way of cars" concept depends on the thinking that "in the way" is necessarily "where the cars are at". In other words, the contention is that the roads that cars are presently occupying are the basic, central social territory that other transport modes must not cede to them. But it doesn't have to be regarded this way. The Netherlands show us another model, one that's actually workable in an advanced industrialised society much like ours. Cars can be pushed out of our towns, and out of the residential and social areas of our cities, if we wish it, to a considerable extent, and their principal arteries, while recognising they need to continue to exist, can be made irrelevant to cycling and walking by parallel provision. Clearly we are a long way from this in the UK right now, but so were the Dutch 40 years ago. (This in a way was what British motorway-building was all about, though that didn't solve our problems because of other policy failures.) The argument about getting bikes "out the way of cars" can be made irrelevant, because "where the cars are" is no longer critical territory for everyday non-motorised living, any more than the railway lines or canals or docks are. There's a paradigm shift in thinking that I'm alluding to here. But if cycle campaigning continues to obsess about "not getting us out of the way" of the cars, we'll continue to be be stuck in the same old loop.
" Borghert Borghmans (@StripyMoggie) tweeted at 1:14 PM on Thu, Feb 28, 2013:@BicycleDutch @ParadiseOxford I see it more as a bridge that solves the problem of road traffic impeding the free flow of cyclists. :-)"
More than that. I such infrastructure as solving the problem of two colliding very different traffic flows. One of the stated reasons for the bridge was the delay caused to cyclists by having to wait for traffic lights. Impatient, reckless cyclists would jump red lights. Rather than wait for the bodies to pile up, and hold hand-wringing, anguished discussions about how cyclists should be educated better and protect themselves with helmets, hi-viz and assertive cycling techniques, the authorities in Enschede commissioned a flyover. It would have been negligent of them not to address the situation. Why are such solutions a problem for vocal section of UK's cycling community? We happily accept that railway level-crossings are replaced by bridges or tunnels. We do so because we see trains and road traffic as incompatible, colliding flows. Motorised traffic and non-motorised traffic are equally incompatible and recognising this the Dutch where necessary have put in place infrastructure that prevents collision between the two very different flows. Some in the UK think that cycling and cars can mix on all roads, except for motorways. They argue that by strapping polystyrene to your skull and using vehicular cycling technique (acting like a car) coexistence can be mutually beneficial. Rubbish. The flyover in Enschede is a well-designed counter-argument to current UK thinking with regards cycling infrastructure. The problem is that motoring on out-of-town roads doesn't exist in a vacuum. Providing for it increases traffic pressure on urban streets, and diverts money away from fixing the urban streets. Building flyovers on the edge of towns isn't inherently objectionable, but it isn't what we need to focus on. Hence it rates a "hmm". Instead, what we need are practical ways of civilising our urban street network that have a chance of working given the space and competing demands, and almost complete lack of funding and enthusiasm among our politicians. Part of the problem is the language. People constantly bang on about "segregation" which is a negative word associated with getting people out of the way. It doesn't even reflect the reality of what is required: protection in dangerous situations. Quiet back streets don't need protection, but say "segregation" and people presume you want complete separation. I did, and opposed the concept, preferring instead the comprehensive Dutch system of protecting cyclists from heavy traffic and using traffic calming in quiet streets. There's no sensation of "segregation"; just provision and protection. I didn't know you were after the same thing. So please let's adopt the Americanism of "protected lanes" and add "protected junctions" along Dutch lines and protect people, not "segregate". Absolutely agree with those who are thinking along the pragmatic lines that segregated facilities can help speed up cycling, never mind motoring. I regularly go 4 miles out of the way on my route home because it gets me away from almost-stationary traffic crawling out of town during the rush hour, not actually because it's safer. The roads are mostly too narrow either to overtake the stationary cars on the right, or to filter along the left (a notoriously risky choice in any case). So I'm held up unless I take avoiding measures. My 12 mile journey takes the same time as the 8 mile route, so it's not an insignificant effect. On the less congested roads the toe-clip is on the other foot: it will be me that's slowing down the motorists. I know because I sometimes drive the same route! Those of us who read bike blogs are probably not, on the whole, in need of encouragement to get on our bikes. The segregated paths may sometimes be irritating to the 2% of habitual cyclists, but they are far less offputting and stressful for new or "returning" cyclists. Cycling is, in my opinion, a fairly low-risk activity, but my colleagues who don't cycle because it's "scary" are not daft, or deluded: they KNOW that they would be stressed out, and quite possibly at higher risk than me, if they wobbled off on a bike for the first time in 20 years along strictly "vehicular" routes. They will not do it, and don't do it, and will never do it without having routes which keep them away from cars. And, galling though it may be to think that anything might divert the spotlight from our right to always use the road, I personally think that the needs of the 98% should be the urgent priority here. The fact that their preferred route is also a faster ride than some "vehicular" routes is an added bonus. I'm not a rolling speed-bump; I'm a person! Road designs which use people on bikes or on foot as a way to force drivers to reduce their speed are gambling with my safety in a way that I don't like and didn't ask for, and their designers should be made to cycle through them, taking the lane, to experience what it's actually like to have an articulated lorry impatiently tailgate you. I think the attitude from cycle campaigners comes from a good instinct. You look at or experience a piece of cycle infrastructure and you quickly know whether is about getting cyclists out of the way in a good way or not. It's no surprise we are suspicious. Where would we draw the line? Is any track better than nothing? Or is only the very best acceptable? Secondly I think motor traffic restraint, or lack of it does affect cycling levels and indeed quality of provision. Therefore I think it matters at a strategic level. But I agree that it's not a good idea to deliberately set out to use cyclists for this purpose. In a country where you have 2% mode share of cycling, it may be tricky to encourage more people to cycle when making driving easier at the same time. Many British traffic planners seem to think it is, witness the rash of road narrowing schemes in London, where a stated objective is often deliberately to allow insufficient space for cars to overtake cyclists in the narrowed lanes, so cyclists regulate the speed of traffic. Consultants seem to have a fairly short tick list of issues with coming up with their concepts which lead us to big open areas of paving, a line of trees and lamp columns and narrow carriageways - often the widened footway areas do not attract footfall for them to be needed. Politicians seem to like a shiny consultant's report rather than listening to their own technical officers and indeed, there are so few technical people in top local authority jobs, there is nobody left to argue. We also have review panels made up of the people funding schemes (TfL definitely does) and I am not convinced they have any concept of cycling or if they do, it comes purely from the aesthetic approach that separated cycle tracks do not look pretty. What to me seems often overlooked or ignored is that the narrow carrigeways do indeed create the conditions where cycle users are rolling road blocks. If the aim is to narrow the carriageway to reduce traffic speed, then fine, but rather than widen the footways all the time, build protected cycle tracks and pave them sympathetically to get the look and stick your trees and lamp columns in between the footway and the track as a buffer from pedestrians wandering in. It just makes you want to rant! "The Dutch are increasingly taking all this away from the cycling experience, and the effect is that everybody wants to cycle in the environment so created." "...streets like this where there isn't a huge amount of room for segregation, can still be cyclist friendly"
If we are going to use the Dutch experience we should analyse it for all the factors that improve the cycling experience. I agree Chris that there is a fair amount of motor traffic sharing the space with bikes in that Amsterdam street that Magnatom videoed. It looks to be on the borderline of the level where it is going to start making cycling unattractive in that street. The Dutch are aiming to reduce the occurrence of this kind of situation all the time with new traffic systems. The kind of thing they are doing more and more to separate without specific cycle paths, tracks or lanes is described by Wagenbuur here and Hembrow here. "And there is always a pro-safety argument to segregation, for any of the modes segregated, foot, bike or car. If you make each flow uniform in terms of speed and momentum, as nearly as you can, which can never be achieved when mixing modes"
Cyclists themselves have significantly different speeds. I think it's the case that very many cycle campaigners are in the speedy/experienced cyclist catergory. Their image is of building up an unimpeded momentum of 15-20 mph; so maybe it's a personal thing rather than, or as well as, the ideology you describe. Whereas your concern is the 96%-98% of the population whose speed 'aspiration' perhaps never exceeds 10 mph. 1. Continuity and priority - not being unprotected at busy junctions, not always having to give way or being instructed to dismount. 2. Not coming into conflict with people who are walking. 3. A comfortable surface - smooth and well-maintained. But I think the 'speedy cyclists', and I would put campaigners including but not limited to CTC as coming from that mentality, have an extra criterion: not to be held up by kids cycling to school, older people going down the shops - the very people you (and I) would like to see having access to their public environment. The speedy riders prefer to be segregated from other types of people riding bikes. I think this is an issue that underlies much of the 'infighting' in our little world, and is going to have to be properly addressed at some point. The preference would be to accommodate both types of cycling, I suppose. Say you imagined that cycle paths in this country could fulfil the first three needs, then meeting the extra criterion for speedy cyclists depends on the width available, I think. In the nirvana Dutch pictures we mostly see, the road+pavements width looks like 20-30m and then you can have cycle paths where there's room for one cyclist to overtake another. But it's when you get to the margins, say 14-18m which includes many many urban roads in this country, that you get to the place where you could provide a segregated path but with limited opportunities for one cyclist to overtake another. So, in this situation, people who aspire to cycle faster will either have to (a) restrain themselves or (b) cycle on the road. I'd hesitate to say I fall quite nicely into your image of the "speedy cyclist" above, I'll often average 16+mph moving speeds in London. When you take into account the regular stops and filtering that can mean pushing 20+ on clear stretches. Riding like that in traffic is stressful and tiring (and exciting, possibly why I enjoy it - it's an adrenaline fix) but is by no means practical for everyone. I can pretty much pin down the point where I realized how nice it is NOT to have to race around to when I was doing a charity ride with some workmates. Due to the varied fitness levels it just wasn't worth racing off like I'd typically ride in London. Not least because the majority of the route was on quiet and scenic country lanes, largely free of motorised traffic which meant I didn't have my usual "urge" to try and move quickly. I realized how pleasant it was to just enjoy the experience of cycling, my surroundings and NOT constantly have a HR in the red zone! I barely broke a sweat on some sections as I happily cruised along, free from having to worry about HGV's and idiots giving me a few inches of clearnace as they passed. I'll admit I did slip back into my London commuting habits when we hit towns (Stevenage's dual carriageways and massive roundabouts probably being the notable example!) as I attacked each section to try and remain safe. Riding away from motorised vehicles, either on seperate tracks (such as along the Lee Valley Canal Path) or on quiet roads/backstreets was just so much more pleasant I really can't understand why people resist seperation so much. If it's a choice between negotiating cyclists or dodging heavy and fast motorised traffic, I'll take dodging grannys and school kids on bikes every time!! Why would I actively choose to put myself in danger? It's just not logical. I read the Easy As Riding a Bike post you mentioned, and actually that's what I had in my mind when I used the phrase "nirvana" Dutch pictures! Every single picture in that post, apart from the Utrecht one where the traffic has been removed, has a massive distance across the roads and pavements. They are great but not that helpful as examples for the many narrower busy roads in UK that need cycle paths. 2. safety strip between road and cycle path: 0.5m. This is just from a look at the London Cycle Design Guide. So that's 13m as an absolute minimum, I would say both cycle path and pavement are still sub-standard in this case and definitely there would be no overtaking on those cycle paths! That's why I think cycle path provision, if it happens, will create situations where one cyclist can not overtake another and speedy cyclists will still prefer the road. Is this bad, either in accident risk for those cyclists still on the road or negative PR about 'unused' cycle paths? Quite a tricky one to answer. I don't agree with your analysis there. I would never support sub-standard cycle tracks where overtaking is not possible and speedy cyclists will feel the need to use the road. If there is not room for 2m wide cycle tracks then some other solution must be found. What this will be depends on the character and location of the road. If it's in the countryside or somewhere else where widening is possible, land should be taken to make room for adequate cycle tracks. If it's in a town and there is no room for widening then there are several possibilities. One is to make the road one-way for motor vehicles. Another is to have both directions of cycle track on one side of the road (a two-way cycle track). This will work in certain circumstances depending on junctions. Then a total width for the track of 3m (as on the current Royal College Street track in Camden) will work because of tidal flows. At peak times most cyclists are going in the same direction, so faster ones can overtake on the other side of the track. But the best solution in city centre locations is going to be removal of all non-access motor traffic by taking the road out of the through-traffic system, creating a "nearly car-free street", as Hembrow terms it. This is the dominant solution in Dutch towns now where the roads are narrow, in many cases replacing older narrow cycle track designs (as in The Hague). This is why you don't see many photos on "A Easy as Riding" or elsewhere of narrow Dutch streets with cycle tracks squeezed on to them. They've tended to phase them out with wider-area traffic removal schemes. So the answer to the "many narrow busy roads in the UK that need cycle paths" is not to squeeze in inadequate ones, but make the roads less busy.This is actually what the Dutch have done. I don't see any problems present in the UK that have not been tackled in Dutch towns and cities. I don't accept that somehow we have a preponderance of narrow roads in the UK. This is a nonsense idea. We've just got too much traffic. Another small point is that it is not necesssary to take up as much space with a segregating island as 0.5m on both sides. There are other possible solutions used in various places that are narrower: bollards, planters (as Camden is now experimenting with), narrow kerbed strips that you do see in places even in the UK, and half pavement height cycle tracks, which may need no protection, depending on the parking situation, as Brighton used on Old Shoreham Road, and are common in Denmark and Germany. Admittedly these only gain you a small amount of space compared to a full kerb-segregated design. The answer to really narrow roads is to make them into bicycle streets, as indeed Hackney has done in Goldsmiths Row. Don't want to stalk your blog so won't post after this. I was trying to say that what we aspire to should be based on how much space there actually is, so we can move beyond the rhetoric. I'm in a different Borough to Brent, but I've been trying to visualise paths in place and it's not always that simple - even when in my head I'm removing all the street parking! 'Making roads less busy'. Well, depends on what alternative routes are available, I suppose. But I always thought that the phrase 'traffic reduction' was very misleading in the Hierarchy of Provision. The more accurate phrase would be 'traffic displacement (with an element of reduction)'. Until really substantial modal shift or reduced travel occurs, a decrease in volume in one road equals some sort of increase in volume in another. And as you no doubt realise, there are obvious disadvantages in having a cycle track only on one side of the road compared to two, such as some people having to cross the road twice to use it. And if you have doubled the space but have two-way cycling then aren't you back at square one? My own opinion is that a narrower cycle path in a situation of limited width is still a big gain as long as it is continuous etc. Why? Because people who would not have cycled along that road can now do so. Where there is more width build wider cycle paths of course. "And if you have doubled the space but have two-way cycling then aren't you back at square one?" No because you don't double the space, you increase it by 50% over a 1x2m track, but capacity is similar to a 2x2m tracks where flow is very tidal. The point about many cyclists having to cross a road and cross back to get to a two-way track is a good one, so the Dutch analyse the origins and destinations of cyclists, and only use this option where it minimises crossings. I have seen cycle tracks in Germany and Italy that are feel safe but are too narrow for overtaking. They still do achieve a considerable increase in cycling. The overtaking problem is not so great as it may appear. It is often possible for faster cyclists to overtake slow children etc. by just taking to the road for a short section, say utilising driveway crossovers, then rejoining the track. In practice a vanishingly small proportion of cyclists seem to reject using the tracks entirely, if they offer significant benefits. 1. Freeing up space for motorists is a classic way of generating more motor traffic. The motor lobby have come up with the same stuff about it being desirable to have less braking etc. to relax motorists. I think Gerhard refers to this above. 2. Of course riding a bike is not something most of us do to reduce motor traffic. It is not why I started out riding a bike, I just wanted to ride a bike. But politics comes into it, and there have to be justifications for why you want whatever pro-cycling policies we decide on. And reducing motor vehicular traffic is a key one of them. Still, I’m just a “No Surrender” kind of guy. Liked the previous post though. 'The Mayor's Vision': Can it work?